How does an OMR Software work? OMR stands for Optical Mark Recognition (or Optical Mark Reader) is the process to capture the human-marked data from documents. No doubt, the traditional techniques used for the evaluation of bundles of OMR sheets were time consuming and required a lot of human-intervention. You can use the OMR software to process surveys, tests, attendance sheets, checklists, and other plain paper bubbled forms. The OMR Software was designed to offer an extra-edge over the present OMR solutions. It is a computer software application that can easily process n number of OMR sheets inconsistency. It will be capturing the optical marks that are created on the forms. The software will extract data from noticeable fields, ranging from checkboxes, fill-in the fields, printed forms, etc. Using the OMR software you can design, vivid range of sheets ranging from the initial OMR sheets to complex bubbled sheets. The user can deploy any type of printing machine to print bundles of similar OMR sheets, thereby making use of a normal paper like the A5, A4, A3, etc. The process of evaluation is simple. The response marked on the sheet can easily be evaluated using a normal scanner unit of type flatbed, ADF and MFP, required scanning the responses. Once, scanned the data marked on the OMR sheets will be converted to digital form. The scanned set of sheets will be saved in a folder and the OMR software is instructed the path to that particular folder to read the responses marked. The digital data will then be read using the OMR software. It will identify the predetermined positions of bubbles on the paper and detect the marked areas. It can easily process unlimited number of sets. 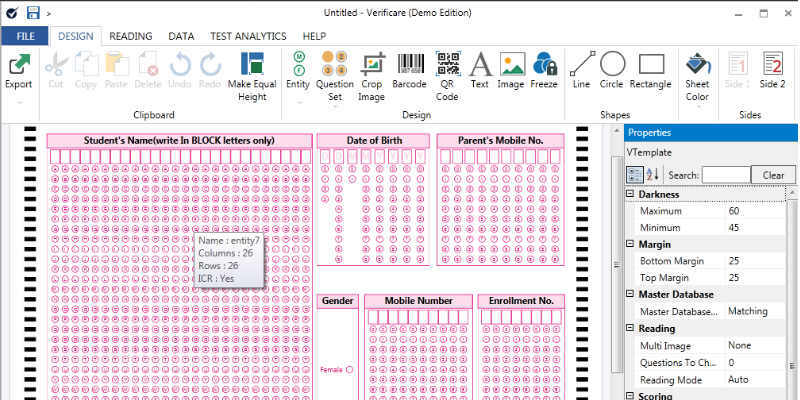 The user has to click on, apply scores and can attain the total scores, computational ranks, section-wise reports and the percentage of the aspirants. The calculated results can easily be exported in different formats including excel, CSV, SQL, etc. SEE ALSO: OMR software Process - Designing to evaluation of OMR sheets defined! OMR software is used to read the pen or pencil marked data. They provide higher efficiency to attain the quality benchmarks for evaluation of sheets. The performance is swift and consistent for bulk number of sheets. The software founds huge application in education, corporate, technology, research, election, ballot, etc. I must say you have very interesting content here. Your website can go viral. Hello,I read your new stuff named “How does an OMR Software work? – OMR Home” like every week.Your story-telling style is awesome, keep up the good work! The need for OMR software originated because early optical mark recognition systems used dedicated scanners and special pre-printed forms with drop-out colors and registration marks. Hello there! This is my first visit to your blog! Your blog provided us valuable information. You have done a extraordinary job! Your posts should go viral. this weblog consists of amazing and actually fine information for readers. I simply want to mention I am very new to blogging and seriously enjoyed this web page. Almost certainly I’m want to bookmark your blog post . You actually come with excellent stories. With thanks for sharing your blog. Fantastic site. A lot of helpful info here. I am sending it to several friends ans also sharing in delicious. And certainly, thank you to your sweat! whoah this blog is fantastic i like reading your posts. Keep up the great work! You understand, many people are looking around for this information, you could help them greatly. I used to be very pleased to find this web-site.I needed to thanks for your time for this wonderful learn!! I undoubtedly enjoying each little bit of it and I’ve you bookmarked to check out new stuff you blog post. We are using the Verificare software provided by OMRHome are satisfied with their support and services. Verificare OMR software provided by OMRHome has completed all the requirements and specifications needed and has provided successful training to DMRC officials. Vice Principal of Delhi Metro Rail Corp. Ltd.
We are fully satisfied with the Verificare OMR software and associated services provided by OMRHome. We wish them good luck for their future business. On Behalf of our institute, it gives me great pleasure in conveying our heart-felt appreciation to Ginger Webs (and your team) in the way have successfully handled our recent requirement of OMR Software, for Competitive Examinations. Verificare helped us a lot in checking papers of test series we conduct. We would like to thanks Ginger Webs Pvt. Ltd. for their support. Previously, it was very difficult job to evaluate student's sheets but with help of Verificare we can do the same work in fraction of minutes. OMR software Process – Designing to evaluation of OMR sheets defined! Guidelines to select best data collecting technology! An informative guide to the process of OMR Sheet Evaluation! Is OMR software “worth the money”?